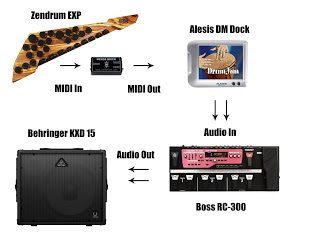 In my previous post, I examined using the Zendrum EXP with MIDI Foot Controllers, specifically the Behringer FCB1010. Once I got past a byzantine learning curve, I was able to effortlessly control MIDI volume, program changes and the like. It was time to turn my attention to the world of Looper Foot Controllers. Many of the musicians I've worked with are masters of these loopers, and pedal boards; Lexicon, Digitech, Boss and Roland. Their ability to build songs on the fly and in real time was both amazing and daunting. They are not for the squeamish and if not played correctly, can be an unforgiving and unmitigated disaster. That's perhaps the biggest reason I shied away from them, and instead invested my time and energy in one shot samplers, like the Akai S2000. In the old days, I'd load my pre-recorded samples into the Akai with an Iomega Zip drive, and trigger the sample from my original instrument, the Drummstick, and later the Zendrum ZX. With the arrival of the Zendrum ZX and its onboard MIDI, I could connect it directly to a MOTU, PreSonus, or M-Audio, MIDI interface into a laptop via USB. I could now trigger sampler apps like Ableton and Izotope's iDrum. 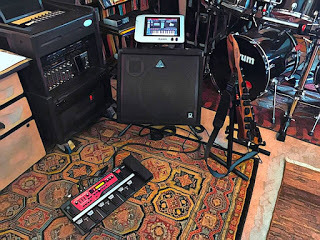 As the laptops became faster, the latency lower and the apps more robust, I added the Zendrum EXP to my arsenal, and added VST apps like BFD2, and Logic Pro to my MacBooks, an Alesis DMDock for iPad, Alesis DM10 drum modules, and the Zendrum Stompblock. Would the RC-300 also be as much of a nightmare to program as the Behringer FCB1010? Well, none of these things are intuitive; The manuals are always lacking, features are hidden, and the whole process can be frustrating. Thank God for all those YouTube tutorials, and user groups! Before I got started on the RC-300 and needed to get my samples ready. My one-shot samples have been the heart of my set-ups since 2001, so importing them to the RC-300 was my first task. After a trip to the Roland/Boss website, I learned I needed to download the drivers for it and the Boss Tone Studio Library. Installation was easy on my MacBook Air; Next, I need to get the samples ready. All of my samples are .AIF files; They do not work with the RC-300. I not only had to convert them to .WAV files, I also found that all those mono files needed to be mixed down to stereo. Out of 55 samples, the RC-300 only accepted 10 of them, and responded with "Unsupported Format!" messages. That was a bummer. I discovered that those samples had "meta-tags" and in their previous lives they may have been MP3s, .AIFs, FLACs, etc. They needed to be reformatted. I tried a bunch of apps, Sound Studio, Audacity, Wondershare, etc. None of them seemed to work. Perhaps I was doing something wrong, as they apparently worked for others but not me. Turns out I wasn't alone, and via one of the Boss user groups I learned about "MediaHuman Audio Converter". Voila, the RC-300 loved them, and my 55 samples were all in! The RC-300 has 3 tracks per preset, and you can use the first 89 presets; The other 90-99 presets are factory demos and the like. That's about 267 total user loop tracks you can work with, and the RC-300's built in Rhythm tracks are a nice plus; (There are a bunch of them, and in a variety of time signatures and styles; jazz, rock, pop, etc. I'm never going to use them, although guitarists, bassists and vocalists do use them). I loaded all of my samples into the first 55 presets. They are permanently stored in the RC-300. 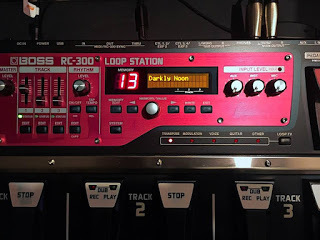 With the Zendrum EXP routed into the instrument input of the RC-300, I can start the loops by tapping Track 1, and add live loops to Track 2, and Track 3. These are not permanent; once you power off the RC-300, the live loops are gone, and you can start anew the next time you boot up. Theoretically you can even do the same with Track 1; The loaded loops are safely written and can't be wiped out unless you delete them. Looking forward to performing live with the RC-300 this weekend; It's already survived its "Baptism of Fire" with a bunch of live jams. 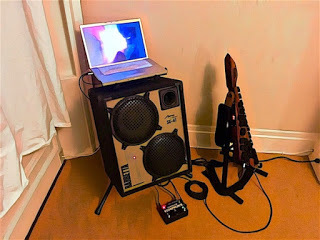 There are ton of other features in this thing, I'm still getting to know it, but it pretty much does what I need it to do; Start, stop, build and fade the loops; Built in reverb, Aux, Mic and stereo Instrument inputs with volume knobs; Individual volume sliders for each track, and a sturdy housing. 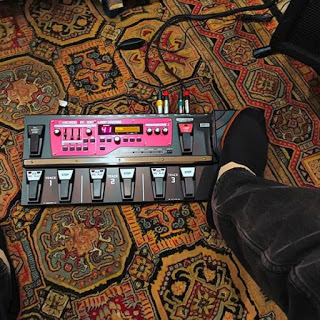 The price tag is hefty $550, but it's Boss' best looper pedal board, and so far, I haven't had any regrets. See you out there!